'The joy of Torah overcomes sadness' - bereaved family members take part in special ceremony after brutal terror attack. 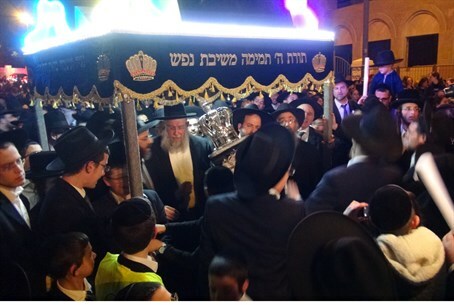 Hundreds of Jews took part on Wednesday night in a ceremony dedicating a new Torah scroll at a Har Nof synagogue in Jerusalem, in memory of the four Jews brutally murdered there by two Arab terrorists last November. The families of all four Jewish victims of the massacre, in which a Druze police officer was also murdered, took part in the celebrations, as did a portion of those who were wounded in the early morning attack against Jews at prayer by terrorists armed with guns, hatchets and knives. Two of the victims were reportedly beheaded in the horrific massacre. Arutz Sheva was at the event, and spoke to Yerachmiel Levine whose father Kalman Levine was murdered in the attack. "My father dreamed of dedicating a Torah scroll and today is a closure on that. It gives us lots of joy after the horrors we went through. The Torah is our joy in life. The joy overcomes the sadness." The bereaved son added "we are going through stages and getting stronger. Yesterday I consoled the Sassoon family (who lost seven children in a tragic fire - ed.) and I told them that G-d gives us strength because we Jews know to continue onward, and we know that as Jews it is our obligation to continue onward." The donator who contributed the Torah scroll, Chaim Bass, told Arutz Sheva "this is our merit, our family's merit. This is joy - not just for us, but for all of the people of Israel. I hope that the dedication of this Torah scroll will start joy anew after the awful massacre."